The last time we were in New York, we went to the taping of a radio game show called Ask Me Another, which was a blast, and I highly recommend. However, we got to the place (a pub called The Bell House) a bit early, and so we decided to wander the neighborhood. 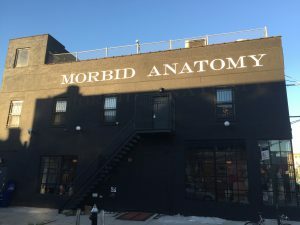 It was fairly industrial, with auto-repair places, etc., but down the street from The Bell House was a museum called The Morbid Anatomy Museum. With a name like that, naturally we had to go in! 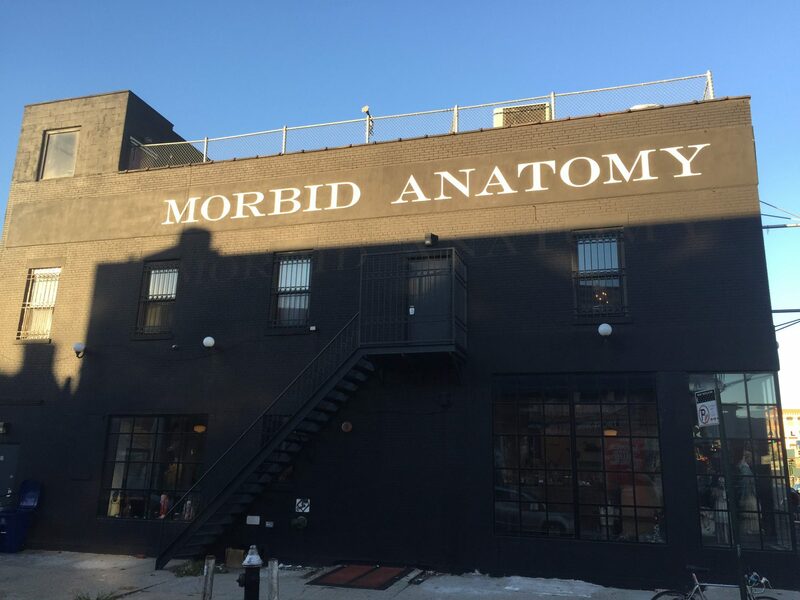 It turned out that it was primarily a taxidermy museum, with nineteenth, and early twentieth century animals. Yes, it was every bit as creepy as it sounds, although interesting as well, in a car-crash sort of way. 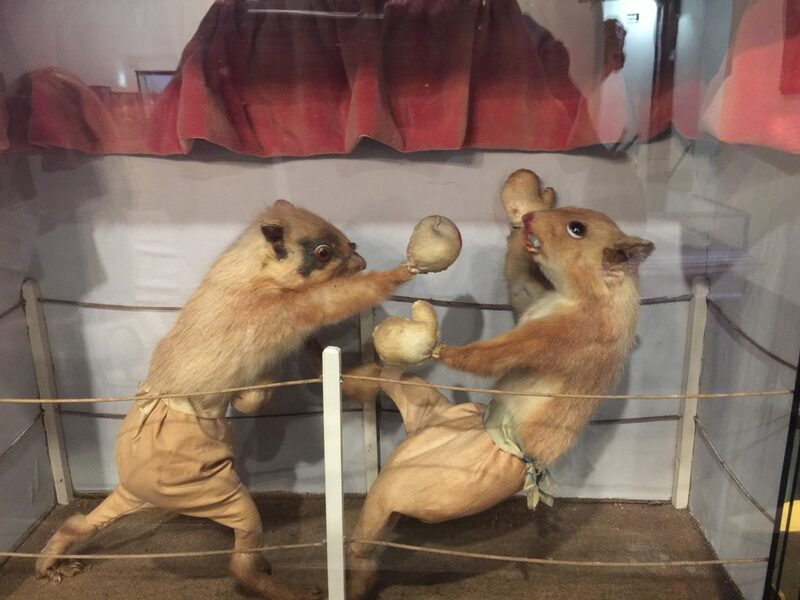 They had various large animals and birds on display, along with a section they called “crap taxidermy” where bad taxidermists accidentally created entirely new species. Sadly, I apparently didn’t take any pictures of those. This was made in 1890 by Walter Potter, who was apparently quite famous for such things. 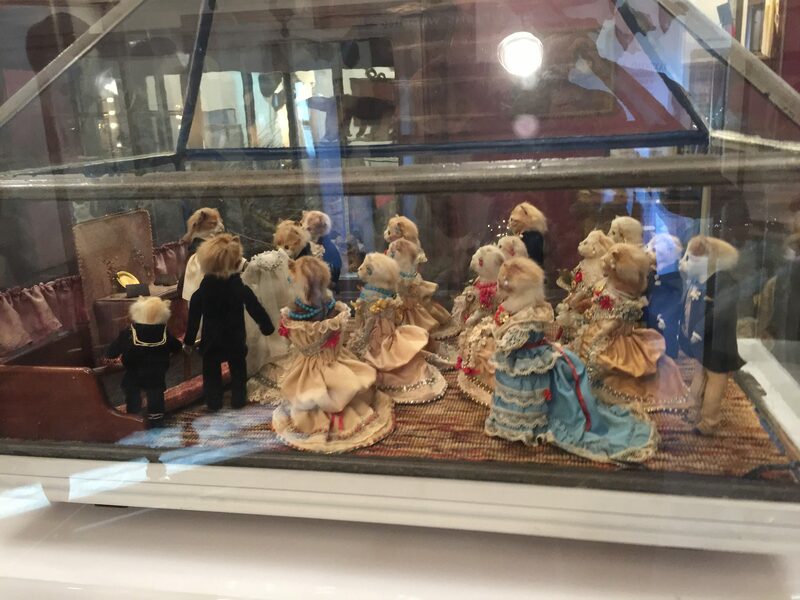 I can only assume that all of the kittens died of natural causes before being added to the display. The card with the display makes a big deal of the dresses, talking about the Bride’s dress of cream brocade, with a long veil and orange blossom. They probably brought in Robin Leach for the commentary. 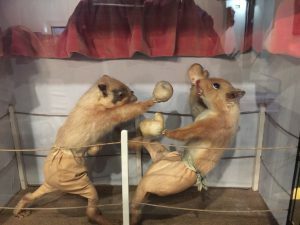 This one seems quite suspect to me, though–everyone knows that weasels are bare-knuckle boxers, so I think that this might be fake. 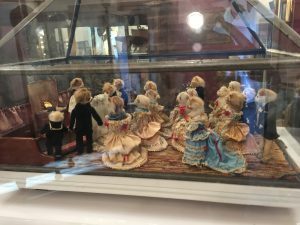 Though they don’t have a kitten’s wedding, they do have a whole jar full of pickled moles, and a case full of preserved animal heads sawn (sagittally) in two. You might have been interested in the (now extinct) quagga skeleton: although they didn’t have all the bones, they completed the skeleton by 3d-printing mirror images of the ones they did have. The Grant Museum sounds a lot more extensive (and organized) than the Morbid Anatomy museum, which was a bit, um, random. I’d never heard of a quagga before. That’s why they have alarms on the cabinets.